Larry King: ‘Duck Tales’ is coming back after 25 years, you’re in it. Did you watch it? Larry King: All about ducks? Ben Schwartz: All about ducks. Larry King: Donald Duck in it? Ben Schwartz: Donald Duck is in the new one by the way, yeah. Ben Schwartz: Give me one more famous duck. If you can do this, one more famous duck, you gave me Donald, give me one more. In the world, it could be anything. Larry King: Daffy, I like Daffy. Ben Schwartz: You did great today. I’m really proud of you. This is just the beginning of an incredible 30 minutes. They said if I do well enough, they’ll spread it to 90 minutes. Larry King: How do you get into the mind of a duck? Ben Schwartz: All right, you put on some Barry White. Ben Schwartz: Ugh how many names are you going to drop, King? Ben Schwartz: That’s one, we should have a mark. Ben Schwartz: This is Herbie Brando or Marlon? Larry King: He was a third baseman. Ben Schwartz: Which team? Minor league, or professional? Larry King: To get into a character, you have to be able to observe characters. And the problem is when you get well-known, characters are observing you. Ben Schwartz: Well that’s interesting. Larry King: So in other words, you can’t sit in a restaurant when everyone’s looking at you, and you observe them. Do you observe ducks? Larry King: Well you’re playing a duck! 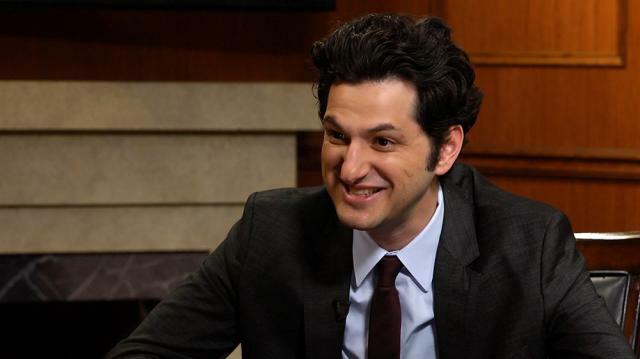 Ben Schwartz: You’re right, but the essence—you’re right, your question is correct, but in essence this is a kid. When I play this duck, it’s not as much a duck as it is a kid, a young kid who just wants to do everything, and he starts off like they lived in a houseboat and now he gets to live in the most fancy, rich place in the universe. His uncle Scrooge is the wealthiest duck in the world, so now we get to move into this thing. So I play with the idea like, “I want to go on adventures, I want to do this,” I play him like a kid that always wanted to do these things that didn’t feel important till now. Larry King: You like writing, you like doing everything, right. Ben Schwartz: So do you do. Larry King: You like being a duck?